The arrival of new BC Social Studies curriculum is a great opportunity to re-examine teaching and assessment practices. At the Pacific Slope, we have been working towards a new model of assessment that emphasizes working with evidence, with sources, and is less about recall. Starting with the end in mind, we use source-based, open-ended questions to explore content, motifs, and guiding ideas in our courses. Some of these questions are about the KNOW -- what is going on here? what information does this source provide, and what questions does it generate? Some of these questions are about the DO -- apply critical thinking skills, mainly the "curricular competencies" featured in the new curriculum.. Some of the questions are about the UNDERSTANDING -- relating learning about the source, and the topics, information, and interpretations behind it, to larger themes from the course including the Big Ideas or Essential Questions. 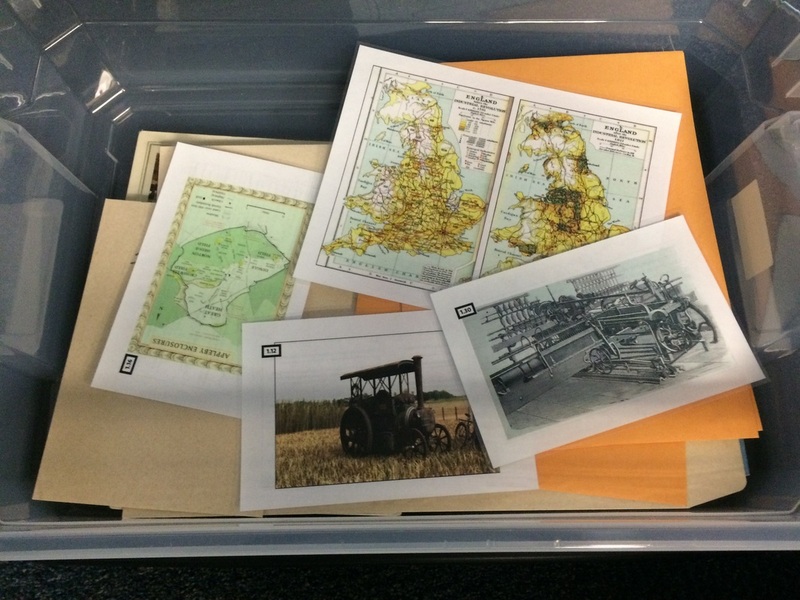 Starting with Social Studies 9, we are developing a series of bins that contain artifacts for use as lesson elements and assessment tools. We are also including sample assessments, and thumb drive with teacher notes, support material, and additional activities. At this point, the artifacts are mainly historic images, primary source documents, maps, and secondary sources such as graphs or diagrams. In the future we plan to include 3-dimensional objects as well. Each Sourcebox is matched to a unit of study in the new Social Studies 9 course, based on a sample outline developed by one of our teachers. Thanks in part to an innovation grant from School District #57 Prince George to the Pacific Slope Consortium, we have completed two Sourceboxes (1 and 5) that are matched to Unit 1 The Age of Invention and Unit 5 The Great War. The plan for 2018-19 is to complete Box 2 (Conflict and Colonization), Box 3 (Building a Nation), and Box 4 (The Many Wests). We have also developed a source activity around the Fraser Canyon War of 1858. See the SS9 page for that. Like many of the projects at the Pacific Slope Consortium, this one started with scheme concocted over food and drink at one of our lakeside retreats. When one of our members returned from a visit to the War Museum in Ottawa, he was impressed with the potential of artifacts to not only tell the story of place and history, but to prompt questions that could double as assessment. "If you lived near this museum, your final exam could literally be a field trip where you walked through and asked students to explain why a particular object was chosen to represent a historical event or a big idea at play." While we can't always travel to a museum, or have the technology at hand to conveniently conduct virtual museum tours, we can certainly curate a few artifacts of our own and put them together as assessment tools. Take the Power Loom. Spend some time getting to know what it was, what it did, what it replaced and so on, and all of a sudden this Thing can be understood as a symbol of the entire Industrial Revolution, the evolution of technology, the influence of one invention and inventor on another, the special context of Britain in the 18th and 19th centuries, changing landscapes,changes to work and workers, and relationship with colonial markets. Our Box project was an experiment in group dynamics, individual strengths and insights, and a collective examination of our practices. We certainly had fun debating and discussing what assessment was for, what form it should take, and what to do with it. We look forward to picking up this project again in 2018-19.